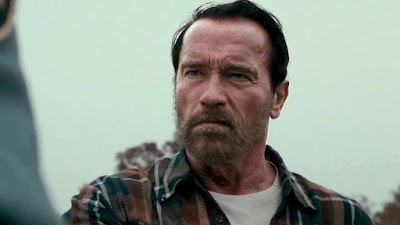 Arnold Schwarzenegger is back and better than ever in the post-apocalyptic story Maggie, also starring Academy Award nominee Abigail Breslin (Best Supporting Actress, Little Miss Sunshine, 2006) and Joely Richardson (TV's "Nip/Tuck," The Girl with the Dragon Tattoo). Maggie follows the outbreak of a deadly zombie virus that sweeps the nation. As the nation reels from a lethal virus that turns its victims into zombies, Wade's (Arnold Schwarzenegger) daughter Maggie (Abigail Breslin) has been infected. 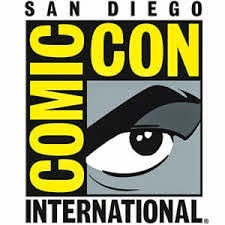 Now, as Maggie's condition worsens, Wade will stop at nothing to protect her from the authorities seeking to kill her to eradicate the virus. The world is facing an epidemic outbreak of the necro-ambulist virus. Quarantines, martial law and curfews are in effect in an attempt to limit the spread of the virus. Somewhere in what appears to be the Midwest, a young girl named Maggie (Abigail Breslin) has run away from home. It was a bit unclear to me if she ran away and was bitten by a zombie or was bitten and then ran away. 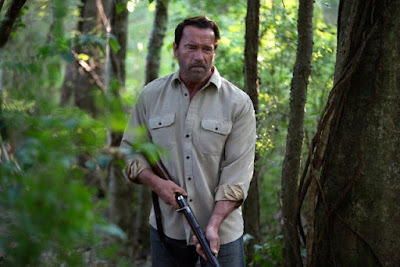 Her father Wade (Arnold Schwarzenegger) goes to find her. She ends up in a hospital which diagnoses her as infected and releases her into her father’s care. He is allowed to take her home to say goodbye. The necro-ambulist virus has no known cure at this time. The amount of time symptoms begin to show varies with each patient but in roughly two weeks the person is gone. The tell-tale sign that they are about to go through “the turn” is an elevated sense of smell. Before the turn, Wade must take Maggie to quarantine. People are told that their loves ones are well cared for until the end but rumors are that they just throw the infected in a room together and let them turn on each other. Wade is given more leeway than normal because he has a close family friend who Maggie’s physician. He falsely reports that her progression is slower than it is. He also tells Wade that the shot they give the patients in quarantine is horribly painful and he suggests Wade take care of it quickly and less painfully at home with his shotgun. Wade brings Maggie home to step-mom Caroline (Joely Richardson) and Maggie two younger siblings, Bobby and Molly. The children are quickly sent away to protect them and Wade and Caroline are left to care for his infected daughter. The difference between being a parent and a step parent become clear as Caroline fears for her safety and thinks of her other children. Wade wants to be there for his daughter and refuses to deal with her impending death. The doctors warned that Maggie would lose her appetite before getting it back, and that’s when they should worry. Sure enough, she wants nothing to eat but suddenly starts smelling the most amazing “food smell”. That smell is actually her parent’s flesh and it won’t be long before Maggie turns. Maggie turned out to be more of a drama than I expected. The movie is all about a father grieving for his daughter and the lengths he will go to in order to protect her, even if he knows he has to let her go in the end. It shows a teenager with a death sentence watching her own body turn on her. It makes the viewer think about what they would do if the person they loved most was infected. Would they diligently turn the person over to be quarantined or would they lock them up as Wade’s neighbor does with her husband and young child. With only a two week incubation period, you wouldn’t make it through the stages of grief and would probably get stuck in denial like a lot of people in this film. This wasn’t a bad movie at all, but it wasn’t the type I’d hoped for. I like the “fun” and sometimes gruesome films like Dawn of the Dead. I like my zombies to be slow, brain dead and hungry for flesh. I also like my post-apocalyptic world to be dangerous, baron and full of zombies. 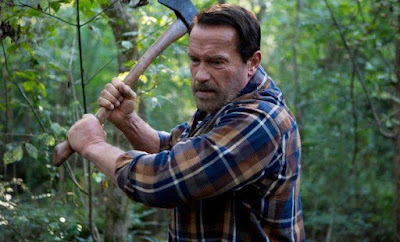 While I am not a huge fan of Arnold Schwarzenegger, I will admit that if zombies came knocking at my door he might be a handy guy to have around when the non-infected are few and they are running for their lives. Maggie is more like a zombie indie drama. I just wish I had known that going into it. Schwarzenegger wasn’t an overblown action star out of place in the film. He played a grieving but tough father very well. Casting choices were good all around. 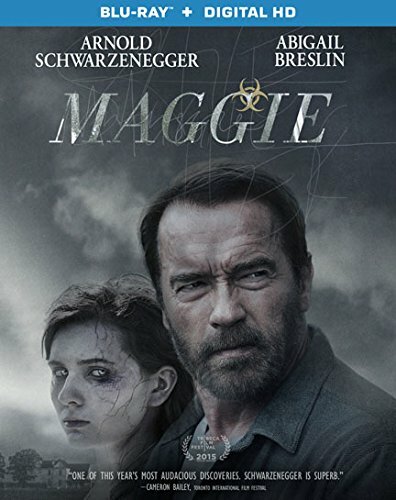 Maggie is presented on Blu-ray in high definition courtesy of Lionsgate with a 2.39:1 ratio. The film almost appears as if it were shot in a sepia tone. Digital grain was intentionally added which does make detail suffer in certain circumstances. They have definitely nailed the hazy look of depression and it works for this film. Zombies aren’t tearing apart their neighbors (that you see) but their blood turns black and varicose veins take on a whole new meaning. Maggie’s DTS-HD Master Audio 5.1 track offers minimal intrusion. You don’t hear birds in the background and much of the film takes place in or near Maggie’s home. It is a dialogue heavy film, and that comes across clearly and intelligibly. The score is very subdued in this virtually problem free audio presentation. Director’s Commentary – Some interesting facts about working with a small budget and choices that helped the Director achieve his vision. Hobson certainly isn’t a natural at providing commentary, leaving longer than normal pauses throughout the commentary. Making Maggie (18:14) – This is your standard making of featurette with behind the scenes footage and interviews. Deleted Scene – A scene with Wade and wife Caroline. 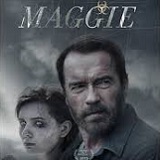 Maggie includes three actors I am not a fan of and a first time director. Considering all that, I think it fairs extremely well. It is not the type of zombie movie I’d hoped for and not the kind I will re-watch regularly. If I’ve injured myself, or don’t feel physically well I always like to watch zombie movies and see people worse off than me (usually those who were just bitten by a neighbor while running for their life). This film would probably make me feel worse. If I was sick and watched Dawn of the Dead I would end it thinking, I forgot for two hours that I was sick. If I watched Maggie I would think, great now I’m sick AND depressed. While I do recommend the film, just be ready for a drama, and not a horror zombie flick. I do have to give the film points for originality however, because most zombie films do go the horror route.